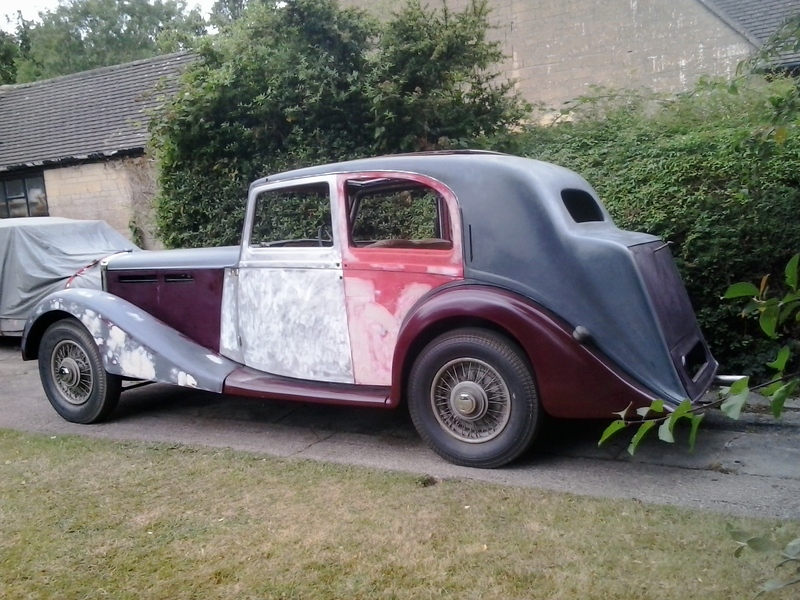 Still unrestored, but hoping to start in 2013! A running chassis with the light-weight body attached. For many years I have admired the sporting saloons manufactured just before the war by the quality firms such as Bentley and Alvis. 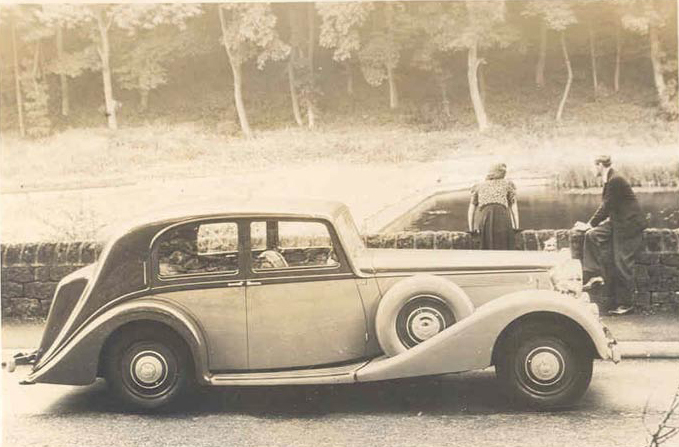 In the early 1930’s Daimler were singularly ‘unsporting’, their products being mainly aimed at the conservative Royal households or the funeral trade. The success of the Bentley ‘silent sports car’ brought about a desire to enter this exciting niche. 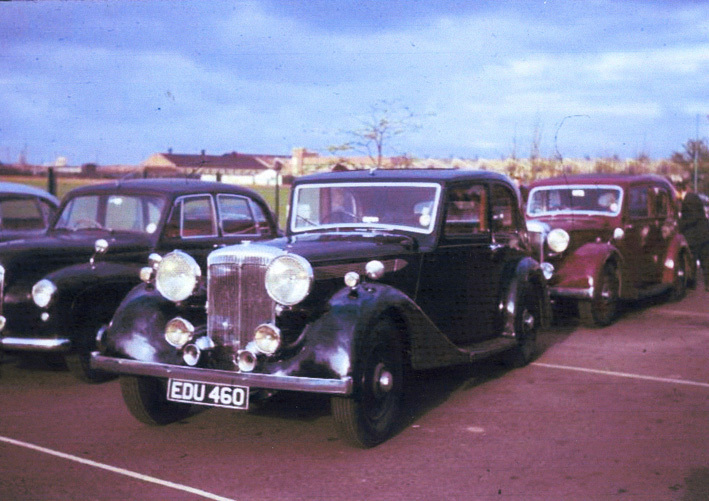 The result was the amazing Light Straight Eight, the first cars manufactured in 1936 were fitted with 31/2 litre engines, these were later enlarged to 4 litres. The engines were built mainly of aluminium and have a non detachable cylinder head, allied to the fluid flywheel and pre-selector gearbox, they are truly smooth and quick, one being timed at Brooklands at 95mph. 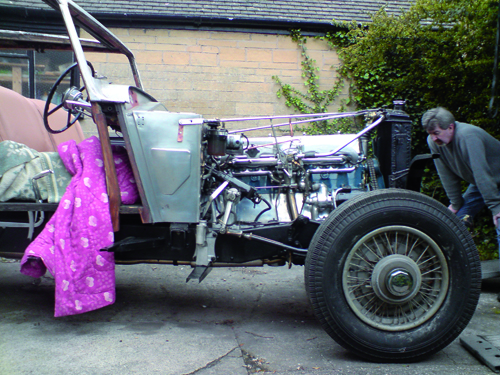 The chassis itself is a work of art, it is light in weight yet very strong, fitted with 17 inch wheels, servo assisted brakes and Daimler’s high quality suspension, the car was a masterpiece. Only a dozen of these beautiful pillarless saloons were built, ten are known to exist, testimony to their quality and desirability! The prices of these rare motor cars has steadily risen over the years and my ambition to own one seemed unlikely to come to fruition. 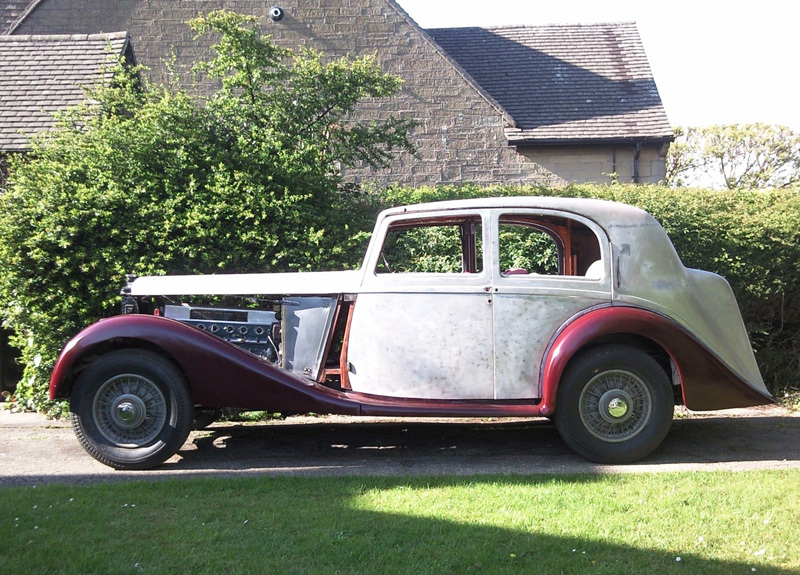 For several years I had exchanged emails with Lars Olof Anderson in Sweden, a fellow Daimler enthusiast, he was carrying out a high quality renovation of a 1939 Vanden Plas E4. Unfortunately Lars Olof tragically died before the restoration was finished. Through the model registrar George Stapley, I was put into contact with his son Christian Anderson, I paid the asking price and made arrangements for the part finished car to be collected from Sweden. My son Nick and I then visited Christian with a huge rented van to collect the many spares and parts not yet fitted back on the car. The journey there and back was fantastic, we crossed on a DFS lines commercial container vessel and using a Sat Nav managed to find our way to Christian in Skovde, arriving just minutes before the agreed time. 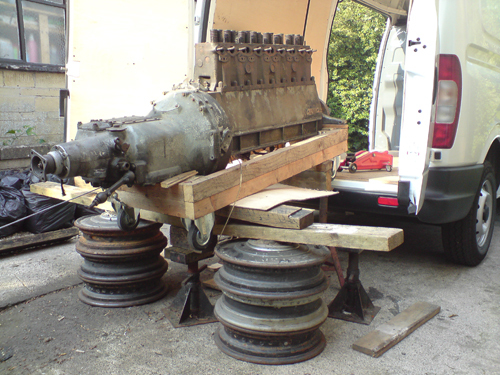 A full morning was spent lifting a huge engine and gearbox and hundreds of smaller parts into the back of the van, once back in Bristol the reverse procedure took even longer! The E4 came along at the wrong time, despite my attempts at having just one car requiring restoration, I had managed to build a small collection of them. The work carried out by Lars was second to none and I felt that to do the car justice, I should attain the same level of excellence. This job was not to be rushed! As a result the other projects have taken priority and have one by one been completed and disposed of. Every now and then I have been tempted by another down at heal motor-car, but have resisted and steadily cleared the decks! As I write this in late 2012, I have owned the E4 for 4 years and hardly touched the car. It is my intention to wheel the Light Straight Eight out of the garage in the spring of 2013 and complete the restoration started by Lars so many years ago. During the winter months I have been cleaning down and preparing some of the panels in preparation for painting. As with every aluminium built car that I have owned, the hardest task is dealing with the numerous dents and dings that the panels have suffered over many years. Most of the defects are small dents and require simply filling and flatting back, it is however very time consuming! The rear wings, running boards and front wings have now received a couple of coats of high build primer and a coat of paint, this is really an undercoat and I am using it to highlight more dents and defects. 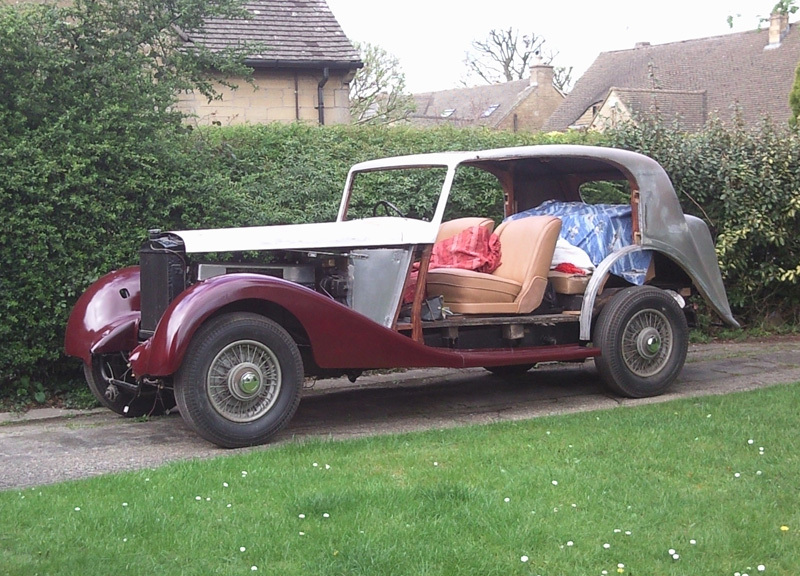 The Daimler has received a new heavy duty battery and starts immediately every time, settling into a nice even tickover and seems to rev very freely. April 2014, work underway at last! 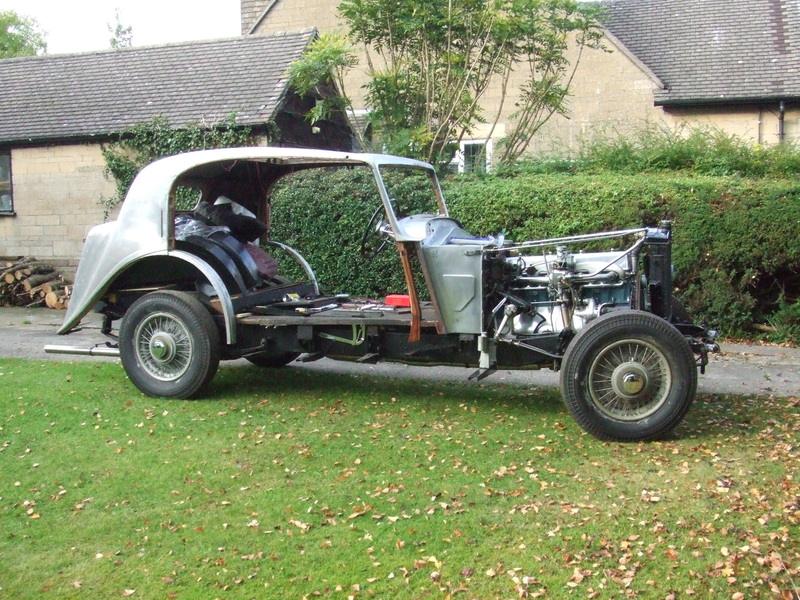 June 2014, I have finally cleared all other projects, although the LQ2-20 I am currently using is an ‘oily rag runner’ and requires more attention to maintain than a car that has been properly restored. The bonnet side panels, front apron and sill panels have now been stripped of their remaining paint and given a coat of etch, several of high build primer and a finally a coat of paint, this has shown up many small dents and scrapes that are not visible when the panels are unpainted. Many hours have been spent filling and flatting these imperfections. 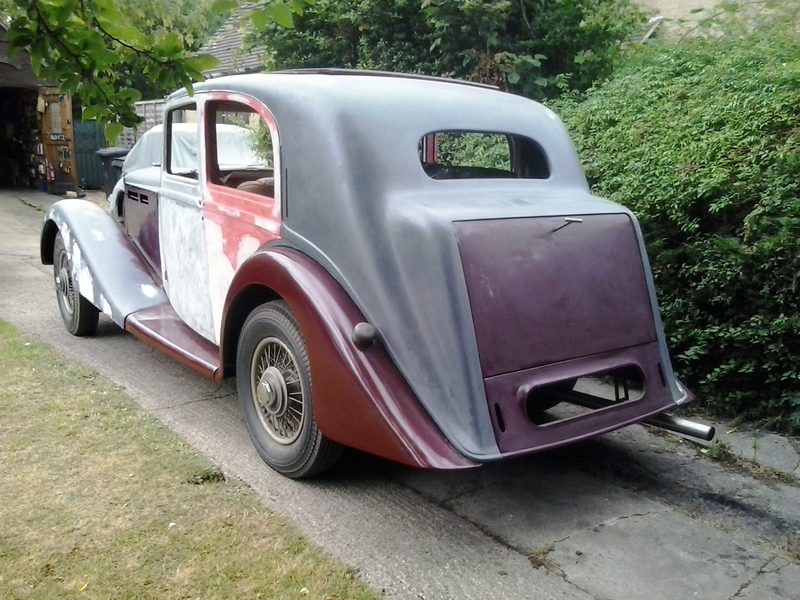 I have cleaned down the doors, more stubborn paint spots will require attention, and trial fitted them to the body, it is very satisfying to see the Daimler looking more like a proper motor car. To relieve the tedium of just attending to the many dents and dings, I tend to alternate one job with another, I have cut and fixed a ply wood floor to the boot area and painted all of the new woodwork with a high quality black exterior paint. 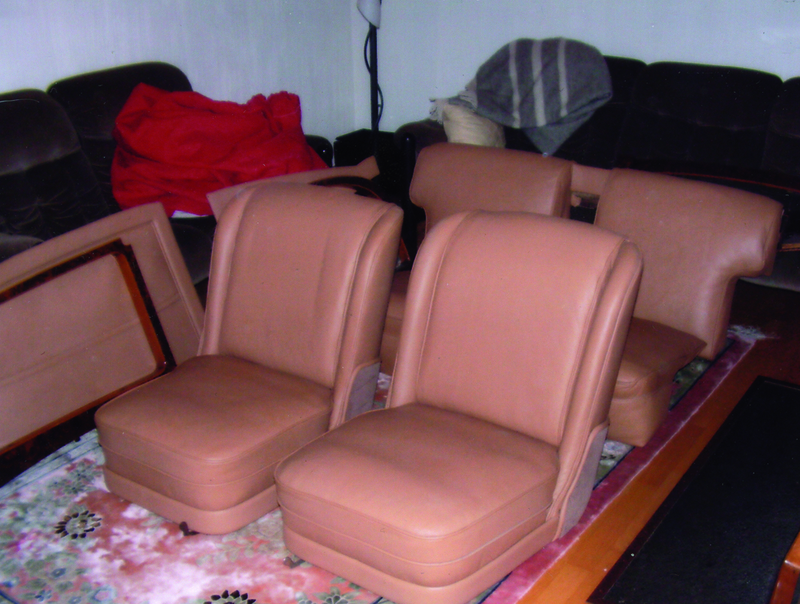 The boot will be carpeted and lined, but it is nice to know that the hidden areas are well protected. 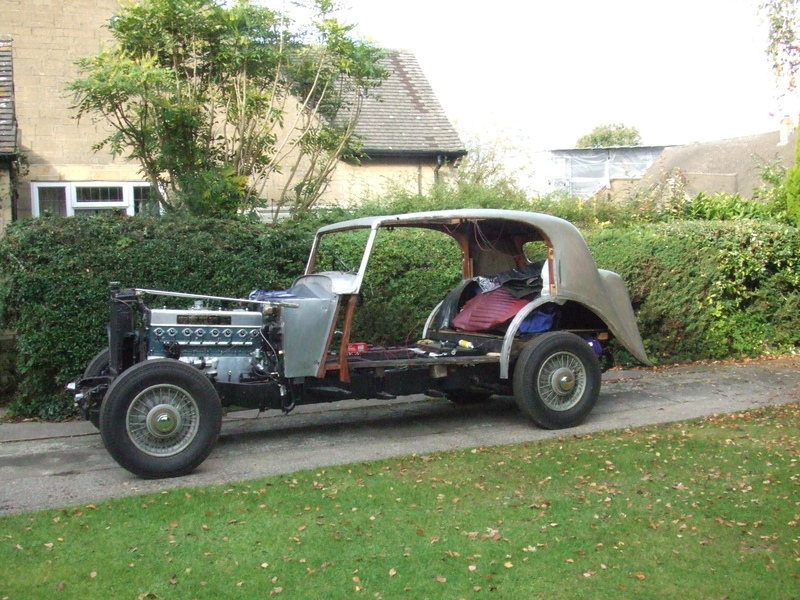 The wiring beneath the instrument panel and floor boards has also received some attention, although it may not look as if much has happened, the Daimler’s restoration is now well under way as I try to spend at least one hour every day on the car. June 2014, looking like a car again! Over the winter months I have been dealing with the many small dents and dings that these large aluminium cars always attract! They are gently tapped out from behind and then given a thin coat of filler, it is surprising how time consuming this job is. It may seem strange to anyone who has never tackled this job, but a dent on a flat panel is much more difficult to rectify than a dent on a curve, coincidentally most of the dents are on the flat parts! 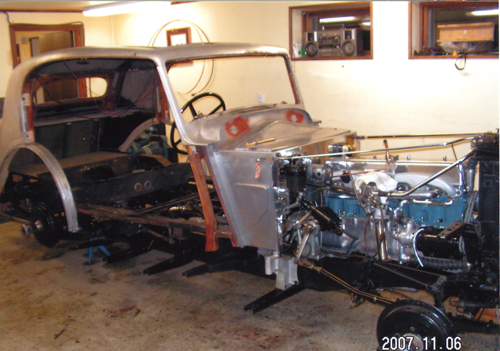 Having owned the car for so long and taken such a long time to restore the car, it is nice to look back at the photographs of what has actually been achieved so far! 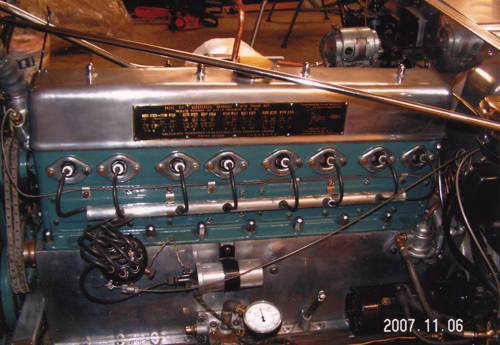 A great deal of time and effort has gone into refurbishing the dashboard and instruments, all of which now operate correctly, and look superb. 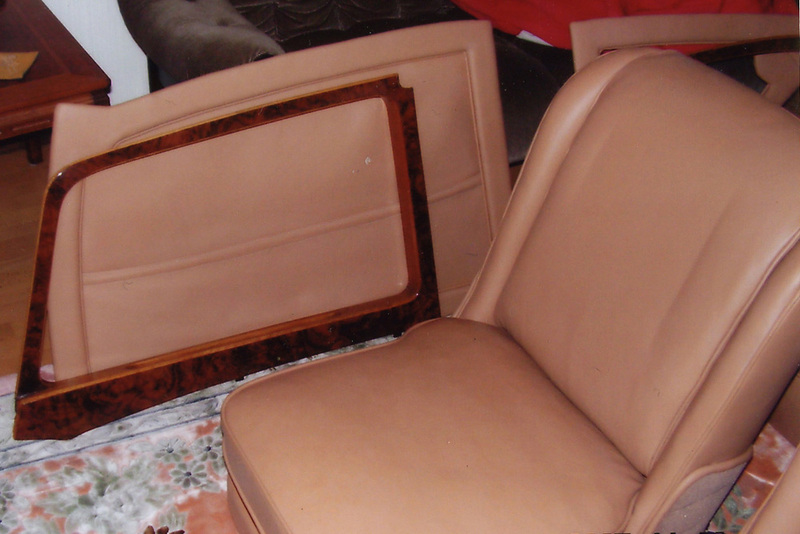 The interior furnishings and trim has been upholstered in the finest leather, in a beautiful light tan colour, it looks fantastic and will no doubt enhance a very comfortable drivers compartment. My son and his long term partner announced their wedding and asked if I would take them in one of my old cars, the E4 is too far from completion to be considered, so a break from restoration has been enforced whilst I repaint the LQ2/20. I hope that the break doesn’t extend to years rather than weeks, as has happened in the past! July 2015 and I have recently carried out some work on the Straight Eight, at last I seem to have found the enthusiasm that has been lacking. One of the jobs that I have been avoiding is the fitting of the ‘A’ posts, like many of these seemingly difficult tasks it was actually quite straightforward although time consuming! 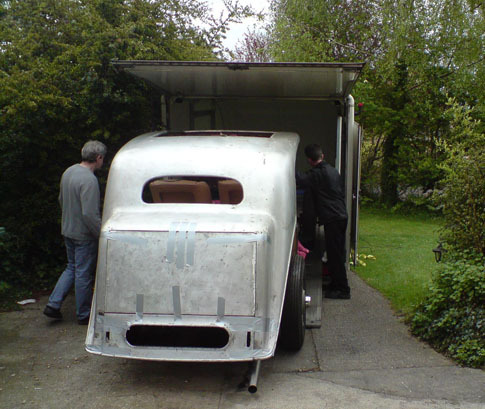 More time has been spent fitting and adjusting the bonnet side panels and knocking out and filling dents on the rear doors. Although there is still a long way to go, I can now see some light at the end of the tunnel and at last the E4 looks like a proper motor car, a short drive around the island in front of my house reveals a powerful and responsive engine, a world away from the LQ2/20 I am currently driving! 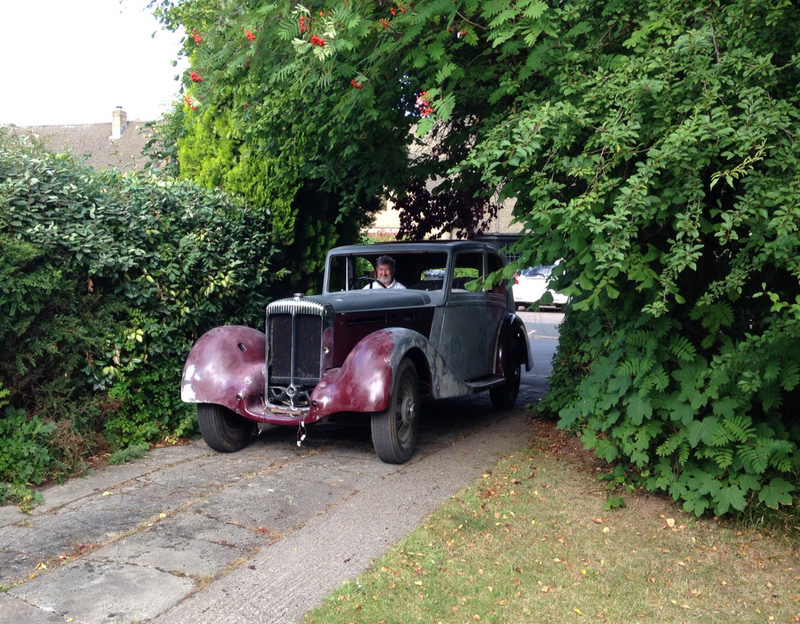 The Daimler now drives and perhaps more importantly stops! Do you own a Light Straight Eight, or perhaps have photographs of one taken in the 1930’s?